There are 8 posts tagged mail (this is page 1 of 2). Continuing the quest for offline hobbies and activities I’ve added a few things to my “stuff I know how to do” list. Last week I was in Westport and instead of getting the lawn guy to take down the sea grass that grows really tall in the backyard (you can see it in this image only now it’s taller and dead) I decided I’d try to do it myself. This involved learning to use a hedge trimmer which I’d never done before. Internet randos claim this isn’t a skill–“Is mopping a skill?” they’d ask–but it felt skillful to me. Especially since I did what every novice hedge trimmer user does and chopped the cord clean off. “Why is that part of the hedge on fire? Oh…” I presume this is something everyone does because 1. that is what everyone told me and 2. it has a replaceable cord. So that went mostly well. Jim helped a lot with the clean up. Always save some time and energy for the clean-up. Advice I used to ignore and now mostly do not. This week I was back at home and had a week with multiple hours of (mostly good) online meetings and I needed a thing to do which was offline and nominally creative. At some point I need to go mossing but the outdoor weather hasn’t been quite there yet. I went by a thrift store to drop off some stuff and found a cool book about as old as I was, full of art photography. I decided to revisit an old hobby which was making envelopes out of nifty old paper. So I spent the time in-between my sub shifts at the library cutting and folding and gluing. I took a few photos and put them online and people asked for more detail so I supplied it in the form of a HOWTO set. And then for laffs I made an animated GIF of all 40+ of my envelopes. I think they look pretty good. Now I need to write some letters. Fortunately this is not difficult. Wrong. I know someone in every state except North Dakota and West Virginia. The project started out like gangbusters. 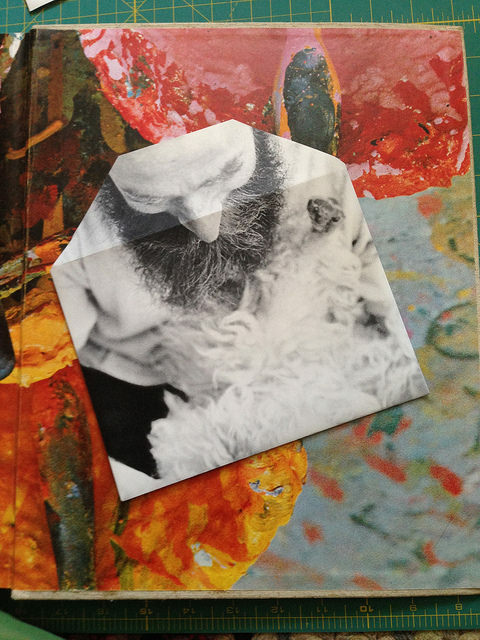 I set a limit of five postcards a day at the outset. 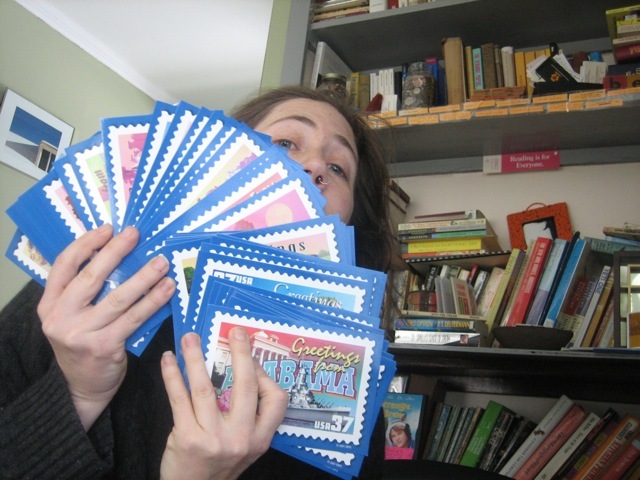 I sent postcards to family, friends, librarians and other random people I’d exchanged mail with in the past. Things started to slow down after the first 30. Once I was down to 15 I started trawling facebook looking for friends in regional networks. Once I was down to eight I took them to the Computers in Libraries conference and specifically sought out people from distant lands like Missouri and Mississippi. Then I asked Twitter when I was down to five. Now I have two left. Does anyone know anyone in North Dakota and West Virginia? It’s embarassing for me because I stayed in Fargo at one of the most fun library conferences I ever went to: NDLA. I stayed with a librarian and her family who had the same last name as me and we watched a Daniel Johnston documentary. However, I’m not sure if she’s still working at the same library and I felt weird pitching a postcard into the void as if it was somehow cheating, so I’ll wait. And West Virginia, I’ve been there too. I was totally surprised it would become a sticking point. So, at this point I’ve sent 48 postcards (plus a few extra for states where I got multiple requests). Including the cost of the postcards, that’s under $20 for a project that kept me busy and problem-solving for well over a month and hopefully cheered up a few folks in various states of the Winter that never ended. Hooray for the mail! update: mailing the 49th and 50th postcards today, thanks everyone! 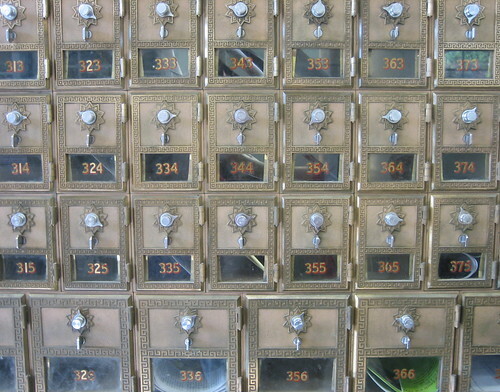 I didn’t realize until I actually went to get my mail that Box 345 may have been empty for a reason…. Not totally sure what is going on here, but they said they’d fix it. Talked to my neighbor from Topsham. He had not called to tell me my house had fallen down, he had called to say hi and sorry for being a jerk a while ago. I forgave him. My car, the one that was broken, that I gave away? Apparently it’s okay and I can maybe have it back. I watched TV on two special days with the word “super” in them but since neither were at my house, my Nielsen rating booklet goes back blank. I’m keeping the dollar they sent me though. I swear it’s been snowing nonstop for 24 hours. I’ve really been enjoying the snow this year with my AWD car. I set up a Twitter account for Donald Barthelme. It was time. I gave my first real talk of 2008 and it went well but not awesome which seems okay because it keeps me on my toes, though I always secretly hope for awesome. I am going to be on a panel at SXSW on March 8th. I am going to be on at the same time as one of the more interesting people who is presenting there. Alas. My Mom is on facebook, feel free to go be friends with her. I succeeded in sending out some piece of mail — fun mail, not bills or anything — every day of January. The resulting deluge of fun mail in response, not from the same people of course, just general karmic response, has filled up my house (Ola’s house) with books and postcards and stickers. I’ll try to do this every January. I got a whole new outlook on garbage, mine in particular, when I had to carry it to the dump myself. In my own car, with my own hands, etc. I feel the same about the leaf explosion that is so popular around here. I love it, same as everyone, but the leaves in my own yard, the ones that come from these big beautiful trees, require moving. Last year Ola hadn’t quite left yet and so did most of the trim and mulch work herself. This year it falls to me. The good news is, I’m really enjoying it, a lot. The bad news is, it’s a LOT OF WORK to move each leaf just across the street. Also it’s starting to get really cold. Today I bought gloves and mulch, the slice across my middle finger reminding me that grass is sharp. Mulch is on sale, it’s that cold out. And back on the topic of mail and writing. I got a lot ready to go this weekend. I packed and prepared four of my books — $84 straight to the EFF, yay for tiny fundraisers — and mailed a friend a box of lawn clippings that I suspect he’ll like. 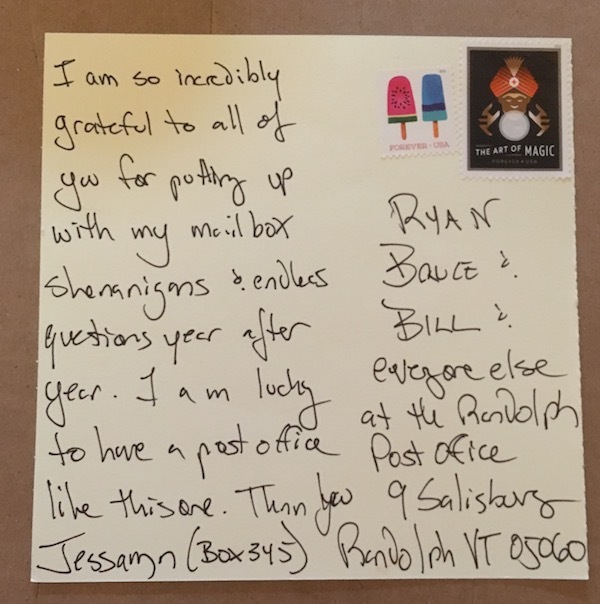 I wrote a letter to my Topsham Postmistress saying that I guess it was time I closed out my PO box there and stopped paying for it, and then I filled out a change of address form and checked the “permanent” instead of the “temporary” box on it. I mailed a copy of The Thin Man to a stranger on PaperBackSwap and I got my inbox down to normal levels by sending a few thoughful and overdue replies. So today, oh my! I know that karma is mostly in my mind and that nothing I actually did this weekend was what caused my mailbox to be full of wonderfulness. Logically, I know this to be true. The mail I got today was sent before I even started my weekend reply-to project. And yet, there was something about feeling that not only did I get awesome mail, I halfway deserved it, that made the rest of my day shiny. What follows is a vaguely dull-to-others list of what I got. A random birthday type present from an old friend including a top-notch Belgian chocolate bar, a tiny box of shells from Capetown, a card and my 128MB USB drive that I had lost at her house last December. Also a stick of RAM, for no reason I could fathom. I wish I could say that the drive contained something fun, but it was just class notes from last year. I woke up today and it was freezing, frosty, frozen outside so I’ve switched the house into Winter mode which means closing all the inside doors, putting the weird little area rugs back around, locking all the doors but the side door, preparing to stop using 75% of the house, and buying plastic for windows. There should be one or two warm days left when I can put it all up. Today I just noticed the sun and the shade as I drove around. Sunny places were warm, shady places were still a little icy, or maybe they just felt that way to me. Tom Robbins once dedicated one of his books — Still Life With Woodpecker, says Google Books — “to everybody whose letters I haven’t answered” which I always thought was an oddly hopeful phrase. This was back when I thought Tom Robbins was the original redheaded truth-teller and well before I saw him speak at Bumbershoot with a “Heaven Doesn’t Want Me and Hell’s Afraid I’ll Take Over” t-shirt and became uninterested in him, boom just like that. But I liked the way I read that and thought he might write to me. I’ve been on the receiving end of more than I’ve been giving lately, and there’s a reason or two for that. I was in recuperation mode after a week on the road. The whole trip went great and I was happy to have gone and happy to be back and those two things aren’t always true. I got back in the pool and back to work and to make a long dull car story very short: the steering rack in my Honda basically disintegrated all at once. My excellent mechanic kindly informed me that while he’d love to take my money, this wasn’t really a repair that was worthwhile since I’d soon need a new oil pan and new snow tires and at the end of it I still had a 12 year old car with 160K miles on it. So, I have to go get the car and drive it home without any power steering and see if I can interest the kid next door in it, otherwise it will go up on Craigslist (unless anyone here wants it. It’s much more cheaply fixable if you can do the work yourself). For now I’m driving the green AskMeMobile and feeling pretty happy that I decided that having two cars was a decent investment a few months back. Now I have basically one. So, I spent some time online thinking about buying a new (to me) car, but I didn’t see what I was looking for. I dislike shopping, and car shopping more than most shopping. Monday I decided to take some of this energy and hit the front yard to get things ready for Winter and with the help of my pal Rick, got a lot accomplished (photos here). Then I went out and kicked a soccer ball around with Kelly and Forrest and by the time I got home, after some beef tacos, I had forgotten that I was in a quandary. Similar thing today. Swam, went to the library, went to Adam and Meredith’s and ate ice cream and pizza and even though I opened my laptop once to see the 31 emails waiting for me, I closed it back up again and waited until I got home to deal with it. So, I’ve been in intake mode more than output mode lately and as long as I’m getting out of bed and dressed sometime before noon, I’m still considering things successful. I’ll get to those letters I’ve been meaning to write. Soon.